Recommended for ages 10 and up. Be sure to check out all the photos and video below! Adult tricycle rentals are great for any party and can be ridden almost anywhere. You can ride the big tricycles at parks, block parties, company picnics or cookouts, inside the office building or your house party. Everyone will have fun with the adult tricycle rentals from Gravity Play Events including parents, teachers or company staff. What a better way to have a company meeting or team building than to have a few laughs with co workers racing giant tricycles. Add a giant race track for an exciting team building activity. Be sure to check out our new team building bike for even more excitement at your party or event. We only rent adult tricycles that sit low to the ground to make them more stable and feature comfortable back rests, pedals with grips and reflective safety tape for safety. Our adult tricycles comes complete with orange cones and skateboard helmets. Our giant tricycle rental price includes standard set up if they are being delivered with a inflatable(s). If you are renting the big tricycles only than delivery and pick up is not included in the rental price. Standard setup is delivery and removal within included delivery area with no restrictions for delivery, set up or pickup. We do not allow these adult trikes to be used on dirt or sand but it can be used on grass, asphalt, concrete, indoors or on artificial grass. 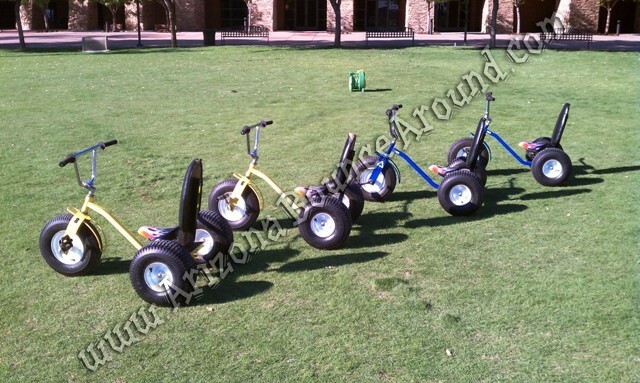 Our Jumbo Trikes will be a big hit at any party or event and everyone will want to ride them. Our Adult Tricycles sit low to the ground making them much safer to ride than the old style Adult Tricycles that sit up real high. You will always get professional quality Jumbo trikes when you rent them from Gravity Play Events. 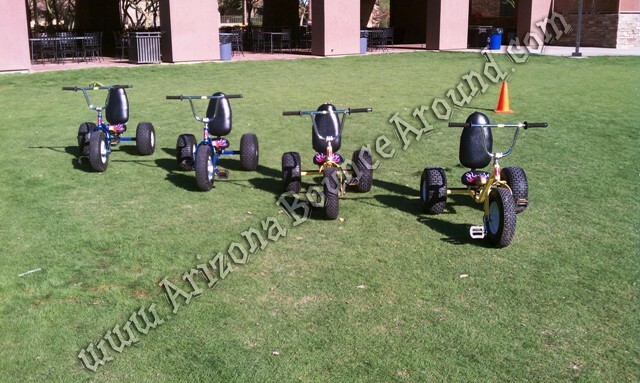 We provide orange cones with every Jumbo Trike rental so you can make your own track or driving course. We also rent giant inflatable race tracks to turn your Adult Tricycles into a big event with checker flags and the racing experience.